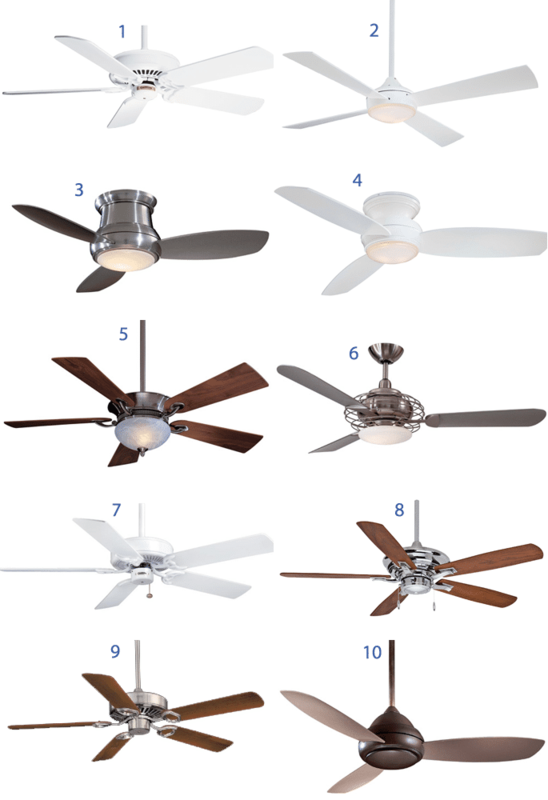 Ceiling fans have been popular for so many years- we all know they save energy by circulating cool air thus raising the thermostat, and sending warm air down from a high ceiling. But before choosing one (or more) there will be some factors to narrow down your search. The first question is always “How high is the ceiling?”. Seven feet from the floor to the bottom of the fan is required by code, but make sure the height is comfortable enough to walk under. A fan is most efficient when it hangs closer to the top, where the heat collects (easier to push the heat down). An 8’ ceiling height will bring us to a flush mounted fan, which, usually, is 11” high. Personal taste comes into play a bit here, if the fan is a decorative element in the room, and the ceiling is 15 feet high, dropping it a couple of feet makes it become part of the room’s décor. In general, a 52” diameter fan is good for a room 12 x 12 or bigger room. A room smaller can use a 42” or 44”. If a room is exceptionally large, and has a high ceiling, consider installing 2 or even 3 fans. Style and color are also considerations, some don’t like the look of fans at all, but want one for the energy savings, so a white fan on a white ceiling blends in and doesn’t make a statement. Alternately, metal and wood finishes compliment furnishings, and decorative details will contribute well to a decorating theme. A common belief is “more blades move more air”, but actually, the steeper the pitch on the blade, the more air it will move. Many of our better fans have a 14 or 15 degree pitch, a less expensive fan with a smaller motor will have only a 10 degree pitch on the blades. Casablanca has an Energy Star certification on many of their fans, too. Many fans have lights built into the bottom of the fan, some even add uplighting on top. Then, let’s say, the fan has a light built in, these also come with a cover the same finish as the fan, to hide the light. Electrical code doesn’t want someone walking into a dark room, so a light on the fan becomes necessary. Remotes and upgraded wall switches are a nice feature in order to reverse the fan. Reversing the direction is advantageous since in winter you will push down the heat that rises to the ceiling, and in summer, you create a draft, making you feel cooler. Light kits for fans can bevery Victorian to very modern. Many are integral to the fan and have a clean and contemporary look. Further, some have lights on top of the motor for ambient light. Following are the top 10 paddle fans sold at Yale. All in all, ceiling fans are a good investment, they gently push heat that has gathered on the ceiling back down to the living space, saving on the heating bill. They also create a draft on a higher speed, making you feel cooler in the summer, allowing for a higher temperature setting on an AC- again saving money. And since the lights are controlled by dimmers, we can save some money on the electricity, and lengthen the life of the bulbs.